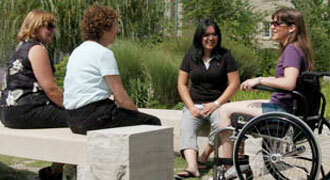 Learn more about the Accessibility for Ontarians with Disabilities Act, 2005 (AODA). Western is committed to achieving barrier free accessibility for persons with disabilities studying, visiting and working at Western. As part of this commitment, there are a variety of services, groups and committees on campus devoted to promoting accessibility and to ensuring that individuals have equitable access to services and facilities. To help provide the best experience to all members of the campus community (students, staff, faculty and visitors), this website offers information on accessibility-related resources available at Western.